Bottom line for me–get eight hours of sleep and stay healthy. Otherwise, virtually every minute while I am researching is dedicated to the mission: make the books more helpful for my readers. While working in Europe, all experiences of the day are dedicated to research. If my readers can’t do it next year…it doesn’t exist. I thrive on local tips, leads, and feedback. Hotel receptionists, who deal with American travelers day in and day out, are hugely helpful. My Madrid hotel doesn’t serve breakfast so I need to find one. If it’s a problem for me…it’s a problem for my readers too. I ask the receptionist’s advice–where’s a good churros place (greasy cigar-shaped doughnuts Spaniards dunk in hot chocolate for breakfast) He says, “Americans want Starbucks…it’s over there.” I need to balance my interest in having people enjoy the old fashioned cliché and the modern reality. I dunk a few churros (it’s a chain cafe…not much local energy) and treat myself to a latte and blueberry muffin (we’re all just human). Next year, it’s in the book. Over coffee I review my goals for the day. Updating a chapter is like that video game where the little guy bounces through all sorts of pitfalls collecting golden rings. He won’t get them all, but the more the better. There are a million little things to check. If I’m well-organized, I’ll visit nearly all in person and minimize what I call “the phone sweep.” As the books have grown, it is unrealistic to physically visit every place mentioned every year. When my time is just about done in a town, I call it good and finish things off by phone. You’ll see phone numbers in many listings that you might wonder “why have a number for that?” It’s there for me (or another researcher) for updating purposes. Making a smart schedule is critical. Minimize walking and do things at the smart time. Checking hotels before 10:00 is bad news–people haven’t checked out yet…the staff is still busy with breakfast. It’s hard to get anyone’s time and it’s hard to see a room. Checking late in the afternoon is also bad–everyone’s checked in for the day and many places are reluctant to show rooms. To save time these days, I often hire a taxi by the hour to hit a series of hotels and sights. This saves time but puts distance between me and the transfer reality of a typical tourist with my guidebook. I need to understand the public transit challenges. I routinely take the subway and bus just to physically do what my readers are doing. For instance, a few days ago I took the new shuttle bus in from the Madrid airport, connected to the subway, and walked and walked and walked between underground trains with what seemed like millions of people with my bags to get to the hotel. This is the experience of my readers and it’s mine too. A major challenge these days is to find the real price of a hotel…sorting through the ups and downs dictated by new-fangled computer programs that predict the demand and price-sensitivity. These days rack rates are bloated to cover the 20% commissions paid to web booking services (which are becoming the standard system for most hotels in Europe these days). I try to convince hoteliers to appreciate my readers coming direct by giving them a net rate (their rack rate less the commission they assumed they’d lose). My great advantage over other researchers is that the recent success of my books means I meet people all the time who I can quiz. They think I’m so friendly and gracious to take time to chat…but I truly enjoy it…and it’s practical–very helpful for me because I learn what works and what doesn’t and what are the pitfalls and frustrations people traveling with my book are dealing with. I wonder when I’ll burn out, but I absolutely love this research work. I guess I’m powered by the proud feeling that no one in America with his name on a guidebook is actually doing this. The sight of my frayed pants and dusty old shoes gives me a tri-athlete’s buzz (I think). I have a knack for finding small business people who love their work in Europe. This gives my books a passion for people-to-people connections. I can understand how President Bush can claim to look into someone’s eyes and see their soul. (But if I’m wrong, it’s just a bad hotel value). I meet someone for a few minutes and factor in their passion and integrity for their work as I decide which of many otherwise similar hotels or restaurants to recommend. How do I find the good hotels and restaurants that make my books work well for travelers? It’s certainly not me. I feel so clumsy in much of Europe. For twenty years I’ve been pushing doors that say pull and walking into doors that say push. Here in Madrid, to say “where’s the toilet?” I still point my index finger to the ground and say “Psss?” My ability to suss out good places is from carefully compiling and building upon twenty years of local tips, and the advice from guides and European friends who generously share their expertise. That is then combined with my secret weapon: 20 years of experience as a tour guide, seeing for myself the joy, fear, frustration, exhaustion, and wonder in the eyes of my travelers up close and personal. It’s expensive to spend so much time researching guidebooks. No other publisher invests so much shoe leather in annual updates. There’s never really enough time. Triage is standard operating procedure. The day is divided between hotels, sightseeing, travel practicalities, and eating. I filter out information on temporary exhibits that are gone next year. Festival events that are rare on the calendar are invisible to me. I don’t care if the Queen’s sharing her box at the Royal Albert Hall…if my readers can’t do it next year, it doesn’t exist. Year after year, I visit the sights and do the walks. Every two years I’m here in Madrid: dropping by the cloistered nuns (just as I propose in the book). I talk into the dark wood of their lazy susan (me in English, them in Spanish), and order their cheapest cookies. This year they spin out lemon short cake. I measure the experience and affirm that it’ll work for my English-speaking readers. I balance time between three star sights all travelers will do and the obscure and new sights. (Yesterday in Madrid, I dropped by the Egyptian temple given to Franco for helping save antiquities from the rising Nile while building the Aswan Dam. Everyone says it has the best city view in town. My experience: The temple is under rated…the view overrated. A big wide view of Madrid only makes you wonder why anyone would build a city in this non-descript piece of Iberia…so don’t seek a big fat view.) But nowhere else in Europe can you see an actual Egyptian temple standing in a park. Lately, restaurants have become a big priority for me in my research…perhaps because I like to eat well now more than in the past. There are two hours of prime restaurant review time each evening. You can bet every evening that’s when I’ll be out–checking restaurants. (I call it “blitzing restaurants.”) I get my ducks in a row (take a minute to write out a smart plan on the map), consider all reader feedback received (both for existing places and tips on new places). My reward–just before the kitchens close…eat at my favorite place visited. Each year I try to add a few and drop a few just to keep things fresh. I can’t eat everywhere…but I can talk to people in each place. If I meet a couple with my book who are eating for the second night in a place (for instance), that’s a fine listing. My challenge is to write up a listing so people can really know which place is best for them when reviewing options back in their hotel room. My image: one traveler is in the shower, their partner is on the bed paging through the guidebook reviewing the options. Listings need to be clear and concise so the right choice is obvious. Menus and the mechanics of ordering can be frustrating. It’s my challenge to sort this out for people. If a stew is a local must-eat experience and big enough for two, I learn if splitting is allowed. If the place is mobbed after 8:30, I’ll suggest ways to avoid the line. If the ambience is great on the ground floor and lousy downstairs, I’ll make that warning. If it’s dead on hot evenings (as many indoor places are), that will be noted. If the business practices are aggressive, I’ll say so with encouragement to understand an itemized bill before paying. Like giving the chapter a haircut, I enjoy trimming extraneous info and needless words that sneak into the book by my crew of earnest and talented researchers and editors. When it comes to a good guidebook, less is more. And I’ve found credibility is hard earned and easily lost. My favorite two comments when on the road researching: local Europeans who marvel at how useful the book is for them when they enjoy a night out; and travelers who pack lots of guidebooks along, but only one leaves the hotel room with them when they’re out and about…mine. More then ever, these books have become a team effort. We’d never be where we are with these without the help of many great writer/travelers. And I am spending more and more time apprenticing researchers. Still, personally writing and maintaining these guidebooks is the work I enjoy most. After a week in central Spain (Madrid, Toledo, Segovia), I’m heading for Ireland. I like to catch emerging neighborhoods in my guidebooks. Here’s a new listing for my 2007 Spain book: In Madrid, a neighborhood called Lavapies is emerging as a colorful magnet for people looking for the multi-ethnic tapestry of Madrid society enjoying pithy, cheap, seedy yet fun-loving life on the streets. As is the case with most neighborhoods like this, they experience an evolution: so cheap only the immigrants, down-trodden, counter-culture types can live there. The liveliness they bring attracts those with more money who like the diversity and color. Businesses erupt to cater to those bohemian/trendy tastes. Rents go up. Those who gave the area the color in the first place can no longer afford to live there. They move out and here comes Starbucks. For now, Lavapies is edgy, yet comfy enough for most. This district has almost no tourists. Old ladies with their tired bodies and busy fans hang out on their tiny balconies as they have for 40 years watching the scene. Shady types lurk on side streets. For food, you’ll find all the various kinds of tapas bars plus great Indian and Moroccan eateries. I list a couple of places that appealed to me…but explore your options. I’d recommend making the entire walk once, then backtrack and eat at the place or places that appeal. From metro stop “Anton Martin” walk down Calle Ave Maria (on its way to becoming Calle Ave Allah) to Plaza Lavapies (old ladies hang out with the swarthy drunks here while a mosaic of cultures treat this square as a communal living room) and then up Calle Lavapies to Plaza Tirso de Molina (with a metro stop). This newly remodeled square was once plagued by druggies. Now with a playground and flower kiosks, it’s homey and inviting. This is a fine example of the vision for Madrid’s public spaces. If traveling to Madrid, keep these places in mind: Bar Melos is a thriving dive jammed with a hungry and nubile local crowd famous for its giant patty melts called Zapatillas de Lacon y Queso (because they are the size and shape of a zapatilla or slipper, €7 feeds at least two, Ave Maria 44). Nuevo Cafe Barbieri is a dying breed of smoky mirror cafe with a circa 1940 ambiance playing classical music in afternoon and jazz in the evening and offering its coffee sippers a menu of loaner books (Ave Maria 45). At Calle Lavapies 44, consider a fun cluster of three places: Indian Restaurant Shapla (good €8 menu); Teteria Lakutubia (an atmospheric tea house); and Montes Wine Bar with countless wines open and served by the glass and good tapas (crawl under the bar to get to the WC). The many side chapels are mostly 16th century and come with big locking gates–a reminder that they were the private sacred domain of the rich families and guilds who “owned” them. They could enjoy private Masses here with their names actually in the blessings and a fine burial spot close to the altar. Its many 17th century paintings hang behind a mahogany wood gate imported from colonial America. The center statue is Mary of the Apocalypse (as described in Revelations, standing on a devil and half moon–looks like bull’s horns). Mary’s pregnant and the devil licks his evil chops waiting to devour the baby Messiah. By the way, only Americans say “Holy Toledo.” Spaniards and the English don’t recognize the phrase. Locals tell me it’s likely from Sephardic Jews (Spanish branch) who emigrated eventually to America. To their American ancestors, Toledo was the most holy Jewish city in Europe…Holy Toledo! Adolfo Vinoteca–The highly respected local chef Adolfo who runs a fine restaurant across the street, runs this wine bar in hopes of introducing the young generation to the culture of fine food and wine. The place offers super elegance without the pretension. You can’t go wrong with their short list of gourmet appetizers (€5 each) and fine local wines (€2 to €3 per glass). I’d just throw myself at the mercy of Jonathan, and enjoy the feeling of gourmet slaves in the kitchen bringing you your wildest edible fancies. If the Starship Enterprise had a Spanish wine & tapas bar, this would be it. Wine is sold at shop prices with a €6 cork fee (daily 12:00-24:00, across from the cathedral at Calle Nuncio Viejo 1, tel. 925-224-244). Madrid is hot. People here say “be thankful you’re not in Sevilla.” I still have a headache from yesterday’s sun. I’ve never had a too-much-sun headache. But it is really hot here. I should break down and trade my headache for a little unsightly hat hair…but no. I often think people who talk about the weather and traffic have nothing else of greater interest on their mind. (Talking about the weather and traffic in Seattle is tiresome.) But here in the lofty and over-heated interior of Spain, even people with plenty to say are talking weather these days. I can’t believe I am assessing restaurants by their air-conditioning. People who don’t have air-con are going to movies just to get a break from the heat. Poor locals, refugees from the heat, lay like lizards in the shade. Maybe Americans who really believe there’s no climate change going on aren’t motivated by their economic self-interest. But I believe many deny the existence of global warming because it’s not good for the economy (in the short term) to deal with it. (That was, after all, the official US rationale for opting out of the Kyoto Accords.) Assuming the engines of the First World economies are driving global warming, any industrialist (or person holding their stock) sitting in air-con splendor while the poor world is getting the brunt of their greed is somewhere between wrong and evil. Many of these people (who have no idea what living poor in the sweltering developing world is like) can’t even consume what they have. What drives them? Call me a liberal, but I’m steaming like the rest of the world. Things are so hot in Spain, that they’ve moved the times of bullfights two hours later…to 9pm. No more sun and shade tickets…everything’s the same (hot in the shade). And that’s where I’m heading. 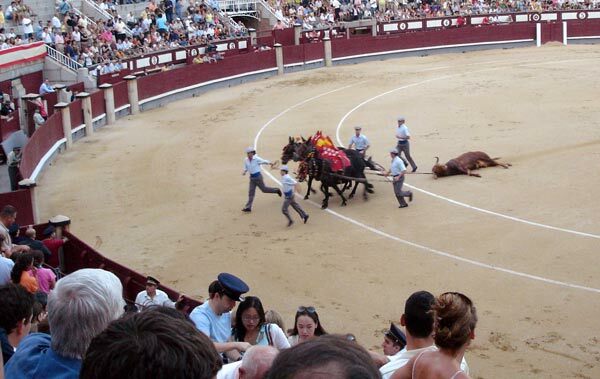 The last stop of the metro line is Madrid’s Plaza de Toros–the biggest bull arena in Spain. From the metro station, the escalator pumps the crowd directly to the front of the arena. It’s all peanuts and crackerjacks…like going to a baseball game. All tickets are only €6 ($8) today as the line up is 3 novice bullfighters (2 bulls each…six fights…two hours of medieval man vs. beast madness). The man in front of me in the ticket line negotiates aggressively for a good seat. I simply say “uno por favore” and end up sitting right next to him. The ramshackle band seems to be directed by the cymbal player who claps a relentless rhythm. At 9:00 sharp, 500 angry and disoriented kilos of bull charges into the arena. Simple old men sit attentively like season pass holders, girls flutter their fans as if aroused by picadors prancing in tight pants. You can tell who’s local and who’s not. Tourists uselessly discharge flashes on their cameras. Local man croak “ole” like old goats and the Spanish women wave their white hankies with the kill. The ritual killing lasts 20 minutes. Then another bull romps into the arena. Of course, even attending a bull fight is controversial among animal rights enthusiasts. I’ve always been ambivalent about the spectacle, thinking as a travel writer I need to report what is here (not judge it and support a boycott). When the event is kept alive by the patronage of tourists, I would then reconsider my reporting. Changing cultures is always fun. I love to feel disoriented, as I am when I first arrive. After a stint in Austria, I’m in Spain. I got up early. Walking around Madrid at 8am people seem in a kind of fog. It’s not clear who’s starting their day and who’s ending it. When I enter a new culture, I have certain rituals. In Spain it’s: a plate of Pimientos de Padron–sautéed mini green peppers with a delightful coat of salt and oil; savoring a slice of jamon iberico–the most expensive ham, made from acorn fed pigs; people-watching over a tall glass of horchata–that milky, nutty refreshing drink you find only in Spain; eating really late–8pm is tea time, no one seriously starts thinking about dinner until 9:30 or 10:00; setting the circa 1950s orange plastic machine into motion as several ugly oranges drop down, are sliced, squeezed, and fill the glass with liquid sunshine; and being really, really hot. Austria is a relatively religious part of Europe. But in Spain, people brand Catholicism into their children with the choice of names. My last cabbie’s name was Angel. The woman at the hotel desk is Maria Jose (Mary and Joseph). The guy who runs my favorite restaurant is Jesus. And another friend is Jose Maria. Men have Maria in their name and women have Jose. I’m done with TV production for the season. Simon is back in Seattle editing together the two new Austria TV shows we just shot and I’m in Spain for five days to update my Spain guidebook and apprentice one of my guides to do more research. As always, Spain is a festival of life. The streets are jam packed with people…at midnight.